“Son of Saul” (“Saul fia”) (2015). Cast: Géza Röhrig, Levente Molnár, Urs Rechn, Gergö Farkas, Balázs Farkas, Sándor Zsótér, Kamil Dobrowolski, Uwe Lauer, Christian Harting, Márton Ágh, Juli Jakab, László Somojai. Director: László Nemes. Screenplay: László Nemes and Clara Royer. Web site. Trailer. When hell descends on earth, preserving anything that even hints at our innate humanity may seem like an impossible task. Just staying alive under such conditions may require everything we have, rendering the act of saving anything morally worthy a virtually unattainable luxury. 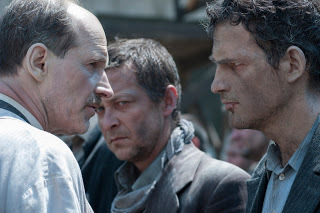 But the value of engaging in an act like this may also prove to be the only thing that allows someone to persevere under such trying circumstances, a scenario pointedly depicted in the gripping new Hungarian feature, “Son of Saul” (“Saul fia”). Saul Ausländer (Géza Röhrig) leads a sickeningly ghastly life. As a Sonderkommando in the Auschwitz concentration camp, he’s been consigned to a special prison work crew charged with aiding his Nazi captors in the gruesome task of exterminating his fellow Jews. While he’s comparatively fortunate, having successfully evaded an otherwise-automatic death sentence, Saul must nevertheless face the day-to-day horrors of having to corral his peers into the camp’s gas chamber, scrub down the floor after each execution session and shovel the cremated remains of the dead into a nearby river. And, despite the reprieve this work affords, Saul knows he awaits a similar fate several months down the road after he’s outlived his perceived usefulness. 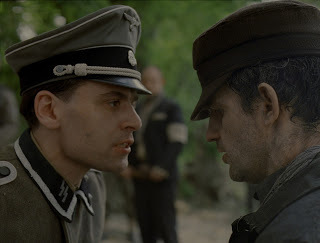 Saul Ausländer (Géza Röhrig, left), a prisoner assigned to a special and particularly gruesome work detail at the infamous Auschwitz concentration camp, seeks to carry out a noble though seemingly impossible mission in the gripping new drama, “Son of Saul.” Photo courtesy of Sony Pictures Classics. Despite these unspeakable circumstances, Saul somehow manages to get through his days by putting up an emotional barricade to block out the atrocities as best he can. Yet something happens one day that pierces this fortified exterior and touches him profoundly. While scrubbing the floor of the gas chamber, he discovers a young boy (dually portrayed by Gergö Farkas and Balázs Farkas) who, though weak, has somehow managed to survive his attempted execution. Saul watches as the child is taken aside and examined by German authorities to see if they can determine how he escaped what should have been certain death – after which he’s quickly and unceremoniously suffocated. The boy’s body is then transferred to the morgue for an autopsy to determine how he failed to succumb to the gas. Saul is moved by the miracle of the boy’s survival, despite his ultimate demise at the hands of the Germans. He accompanies the corpse to the morgue, where he makes a request of the attending physician (Sándor Zsótér): Instead of callously tossing the boy’s body onto the pile of remains awaiting cremation, Saul asks the doctor to give him the corpse so that he might conduct a proper burial for the child, one preferably officiated by a rabbi. The doctor, who is himself a prisoner, sympathizes with Saul’s request but says he’s unable to comply. However, Saul is determined to see his plan through, to provide the young victim with a semblance of humanity where none exists, even if it’s the last thing he does. Saul Ausländer (Géza Röhrig, right), a prisoner assigned to a special work detail at the infamous Auschwitz concentration camp, asks an unusual favor of a camp physician (Sándor Zsótér, left) who is also a prisoner in director László Nemes’s debut feature, “Son of Saul.” Photo by Ildi Hermann, courtesy of Sony Pictures Classics. Saul thus sets out on a quest to extricate the body from the morgue, to find a way to perform the burial and to locate a rabbi from among the camp’s prisoners to oversee the proceedings. But this mission proves far more difficult than initially imagined. In addition to attending to his required work tasks, Saul finds himself having to cut deals with his fellow Sonderkommandos to see his goals realized. In the process, he becomes embroiled in the plans of a resistance movement seeking to document the camp’s atrocities and to stage an armed rebellion. He also becomes caught up in the feuding of rival prisoner factions seeking to curry favor with guards and other camp officials as a means of prolonging their own lives. It often carries Saul far afield from his objective, yet he never gives up, moving forward and doing whatever it takes to stay alive and to see his goal realized. In the midst of conditions like these, it’s hard to fathom anyone being able to focus on anything other than sheer survival. The daily challenges of doing whatever it takes just to keep from being sent to one’s death must be overwhelming. Yet, even when ensconced in such pervasive horrors, Saul manages to hold on to his belief that bestowing a modicum of dignity upon someone is still indeed possible. And, as he goes about seeking the realization of that ambition, he draws upon every bit of inner strength he can muster to bring it about. No matter what belief system one subscribes to, it’s at times like this when one’s faith in it invariably gets seriously tested. For those who adhere to the practice of conscious creation, the philosophy that maintains we create the existence we experience through our thoughts, beliefs and intents, holding fast to that mindset must seem nearly impossible under conditions like this, if for no other reason than wondering how and why we’ve ended up under such circumstances in the first place. But, when one adds to that conundrum the hope of seeking the fulfillment of some additional seemingly unachievable objective, it’s difficult to imagine how one could possibly carry on. And yet Saul persists in his endeavor, convinced of the validity – and inevitability – of its materialization. Saul Ausländer (Géza Röhrig, right), a prisoner assigned to a special work detail at the infamous Auschwitz concentration camp, frequently runs afoul of German authorities, such as Oberscharführer Busch (Christian Harting, left), in the gripping new release from Hungary, “Son of Saul.” Photo courtesy of Sony Pictures Classics. As conscious creators are well aware, all possibilities are capable of manifestation if the beliefs supporting them are sufficiently strong and clear. In Saul’s case, he’s certain that his goal can be attained by holding firm to his beliefs in the idea. He can envision it, seeing the intangible notion ultimately being made tangible. 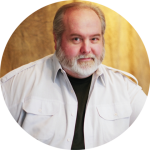 For some, that might seem wholly unrealistic, but, for Saul, it’s a belief that keeps him going, one that enables him to forge on.  A belief that humanity indeed can survive where it seemingly should perish is a powerful notion, an idea that just might be sufficiently potent to eventually be realized – and to sustain its creator long enough to see its ultimate fulfillment. In reaching a point like that – especially under circumstances like these – it’s highly likely that one would be willing to do whatever it takes to see the outcome materialize. And so it is with Saul. Given the fate that he’s facing for himself, in many ways he has nothing to lose to see his goal fulfilled. With an awareness such as that, it becomes comparatively easy to cast aside our fears – the limiting beliefs that frequently undermine our manifestation efforts – and to live heroically in seeking the attainment of our objectives. If Saul must come to terms with the prospect of his own impending death, he probably finds it preferable to go out embracing what he holds dear than to transition with thoughts of good intentions remaining unfulfilled. Many would likely believe that it’s impossible to contemplate lofty philosophical notions such as these in a setting as utterly grotesque and devoid of humanity as a concentration camp. But, considering the prevailing conditions of a place as wicked as this, if one can’t bring forth at least a shred of it under such circumstances, then one could argue there’s little hope for the human race at all. Thankfully, there are characters like Saul to remind us of this – and of the importance to hold on to our belief in it, no matter how bleak things may seem. Saul Ausländer (Géza Röhrig), a prisoner assigned to a special work detail at the infamous Auschwitz concentration camp, routinely engages in gruesome tasks like scrubbing the floor of the facility’s gas chamber in the visceral new release, “Son of Saul.” Photo courtesy of Sony Pictures Classics. 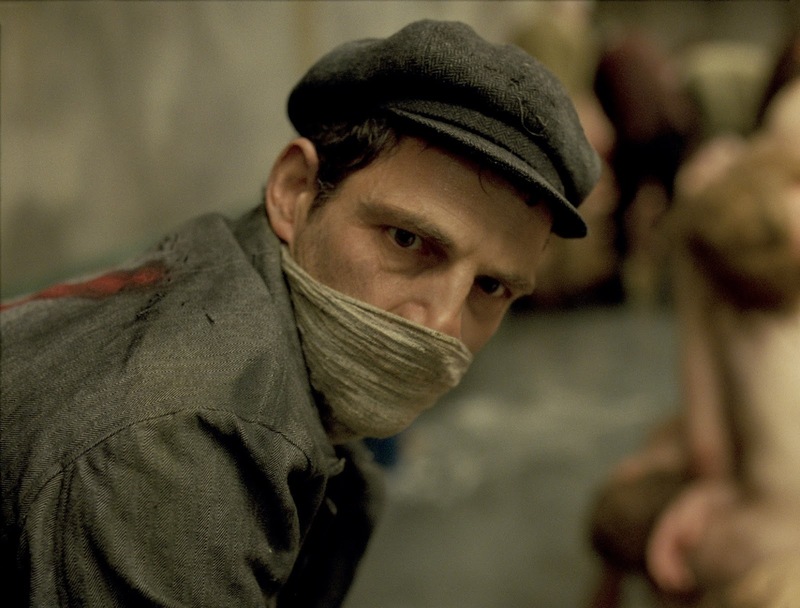 “Son of Saul” is a decidedly troubling film to watch, but it’s also one that triumphantly speaks to our humanity and the need to never lose sight of it. Filmed mostly up-close with hand-held cameras, director László Nemes puts viewers squarely in the middle of the story, allowing the audience to experience the gruesome, inhumane indignities firsthand while skillfully hinting at the horrors taking place around them without resorting to gratuitously graphic depictions. Géza Röhrig gives a moving, quietly powerful performance as a man determined to see through his sacred mission, frequently getting more impact out of a simple gesture or facial expression than any line of dialogue. The strongly visceral feeling this picture evokes is definitely not for everyone, but, for those willing to summon up the courage and allow themselves to be exposed to the inspiration of this experience, this one should not be missed. 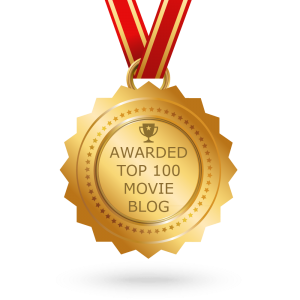 The film is currently playing in limited release in theaters specializing in foreign and independent cinema. 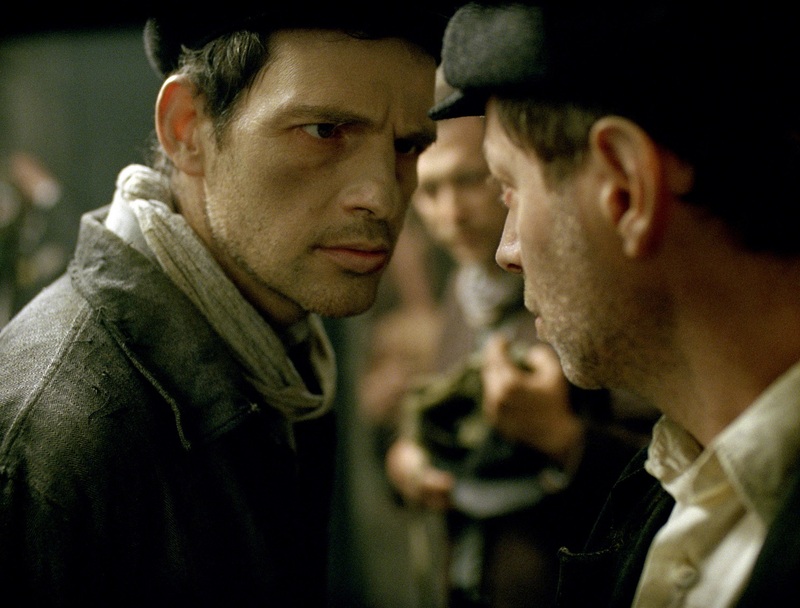 “Son of Saul” has been lavishly praised in this year’s awards competitions, having won the Critics Choice Award and the Golden Globe Award for best foreign language film. Earlier in 2015 the picture won four Cannes Film Festival awards (including the FIPRESCI Prize and the Grand Prize of the Jury) on six total nominations (including a nod for the Palme d’Or, the Festival’s highest honor). The picture is also nominated in the foreign language film category in the upcoming Independent Spirit and Academy Award competitions. Regrettably, man has all too often figured out ways to degrade and destroy his peers. Fortunately, however, he has also learned the wisdom of qualities like compassion, mercy and dignity, forces more meaningful and powerful than anything he could ever use to inflict harm on his fellows. And, thankfully, no matter how great the perils might be that threaten to consume us, we always have the ability to draw upon these finer attributes to see us through, provided we believe in their merits and are willing to allow their magnificence to shine through. Saul Ausländer provides a glowing example of this, lighting the way through the darkness and leading us to a state of being to which we should all aspire.